As the end of the year approaches, I’m trying to clear out as many of my blog post drafts as possible. Like this one! I actually made this purchase back in February. Seemingly at PNE every year and every one of the numerous home & garden shows at BC Place, there is a Nellie’s kiosk. I haven’t been more drawn to it as I have been this year. I guess you could say it’s the year of finally being aware, of being ready to make better choices about the products I purchase. 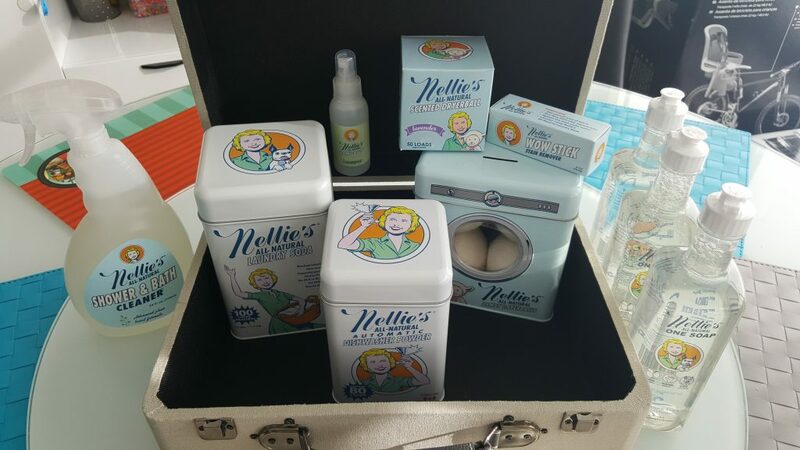 And easy start is to buy a Nellie’s starter bundle. While there are discounts at the booths, I’ve also been subscribed to their email newsletter and there are discounts throughout the year at which point people probably load up on what they need. For the starter bundle, there is a starting list of products to allow you to sample all their products. The substitution I made was to swap out the oxygen brightener for additional hand/dish soap. It is advertised as “over $120 of products” for which I paid $100. Of course I did the math and cobbling the best of London Drugs and Amazon prices for the products you see here, it was $160, not including the $40 suitcase, $20 lamb stuffie and whatever you’d pay for an oversized shopping tote bag. Dryer balls – The pointed plastic dryer balls have put numerous dents in our dryer and I’m marvelling how I didn’t switch to wool sooner. I guess I didn’t know who to trust on Amazon and should have just gotten the Nellie’s one a long time ago. The cute container they come in looks like a laundry machine and doubles as a coin bank. We have apartment-sized laundry machines so I’m only using two of the four balls. Scented dryer ball – I went with the lavender one because you can’t have enough lavender and create a soothing atmosphere at home! It’s good for a year and I started using it pretty much right away. With the two unscented balls, three balls rolling around is plenty in our small dryer. Wow stick – This is just the best thing ever. The stick format is great because you can apply at a particular spot instead of spraying and having stain remover run everywhere and it plain works, easily, while also being gentle on your skin. Laundry soap – I like it – It feels economical but powerful enough. I am very much convinced by their IG posts earlier this year that liquid forms of detergent is just filler. Dishwash soap – We are still only using the unscented version and I don’t know if that is influencing me, questioning its cleaning ability. Not exactly, though. But it’s also a lot runnier than I’m accustomed to and I wonder if that is a lack of fillers. As a result, NPY uses a lot more of the product than he might otherwise. Wrinkle B Gone – I keep forgetting to use this one – I’m not even sure I know where it is. I saw a demonstration on IG for a similar product from another company but for that product, it seemed tedious to use. Still, you don’t have to break out the iron or steamer. I’m looking forward to when we’ve finished these products and getting package-free or reduced packaging with regards to refills. I definitely want to be refilling these tins and not getting new ones each time. The lamb stuffie is practically useless – it is not the kid’s favourite stuffie but thought it was a suitable choice (the alternative was yet another waterball, S’Well style) because the kid is born in the year of the sheep, and he didn’t have another other sheep stuffie yet. The vintage suitcase is pretty cute and currently filled with the kid’s baby books. It was used quite a bit during the summer as a door stop when we wanted to ventilate the apartment during the summer and kept the door ajar.